JUBA, Oct 4 2012 (IPS) - Pressure from ethnic groups along the border, security concerns, and keen interest in resources like oil and land are making it difficult for Sudan and South Sudan – the world’s newest country – to resolve their dispute over the fertile, oil-rich region of Abyei and demarcate their common border. Speaking in Turkey on Monday, Sudan’s first vice president, Ali Osman Taha, called for a referendum to resolve the issue. In talks last week in the Ethiopian capital, President Omar al-Bashir of Sudan and President Salva Kiir of South Sudan signed economic and security accords that will allow a resumption of oil exports from South Sudan. However, no agreement on Abyei was reached. The African Union High-Level Implementation Panel (AUHIP), which is mediating between the two countries, presented proposals on the final status of Abyei on Sep. 21. The proposal includes a call on Sudan to recognise Abyei as a historic land of the Dinka Ngok – the biggest ethnic group in South Sudan, which became an independent nation in July 2011 – and their right to civic and political participation and to protection of individual rights. Juba accepted the African Union proposals. But Khartoum rejected them, saying the mediators did not recognise the right of the nomadic Misseriya Arab ethnic group to participate in a referendum on the final status of Abyei. “I think it is difficult for both governments to give up Abyei because of the need to satisfy the needs of ethnic groups on the border,” Dr. Leben Nelson Moro, a professor of development studies at the University of Juba, told IPS. For centuries, Arab nomads from Sudan’s South Kordofan state have grazed their animals in Abyei, where pasture and water are available even during the dry season. But the Dinka Ngok, the traditional inhabitants of the area, consider the land to be theirs from time immemorial. After Sudan’s independence in 1956, the largely Muslim Arab north and the mainly Christian and animist south fought two civil wars. The most recent lasted over two decades, and an estimated two million people were killed and four million displaced before a 2005 treaty ended the conflict by splitting the country in two. Although the two countries have agreed on 75 to 80 percent of their border based on a 1956 map drawn by the then colonial government of Britain, the actual demarcation has not taken place. Both governments are under pressure from communities along the border, who want to be assured that they will still be allowed to cross to the other side. 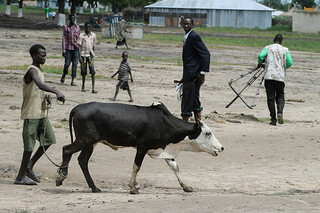 Khartoum is particularly concerned about the views of the nomadic communities along the border, which want guarantees that they will be allowed to graze their animals in the disputed areas. “Fixing a border is not in line with the way the people in border areas live,” Wesselink said. Another factor hindering the resolution of disputes and the demarcation of the border has to do with security concerns on both sides, but especially in Sudan, which links the security of the disputed border areas to its own survival. “The pastoralist Arab tribes of Rezeigat, Misseriya and Baggara already feel marginalised by Khartoum. The leadership (of Sudan) is aware of this and wants to protect the interests of these people,” said Edmong Yakani, coordinator of the Community Empowerment for Progress Organisation (CEPO), a local NGO that has studied relations between communities along the border. “Khartoum thinks that if the border is demarcated and the pasture lands end up as part of South Sudan, then there is a danger that the tribes allied to it will feel marginalised and let down by Khartoum. Given that Khartoum is already fighting SPLM-N (Sudan People’s Liberation Movement–North) rebels in Blue Nile and South Kordofan, it is keen not to offend more ethnic groups, to prevent further rebellion,” Yakani told IPS. Because of the conflict in these two Sudanese states, Khartoum wants to take charge of all the disputed areas so it can try to cut the rebels’ access to South Sudan, which it accuses of supporting them. “The government would like to have good allies in the area, for example people like the Murahalin (Arab nomads),” Moro said. Some observers also say the two countries see the border areas as sources of wealth. “Look at the Gezira area and the White Nile area of Sudan, which are wealthy agricultural areas. It is the same case with South Sudan, which also wants to secure areas like Renk and Aweil, which are all agriculturally rich,” Yakani said. South Sudan army spokesman Colonel Philip Aguer recently stated that he believed Khartoum was using militias opposed to the South Sudan government to derail plans to resolve border issues, with a view to taking possession of oil resources in border areas. International arbitration could help the two countries deal with pressure from communities in the disputed area. “At least if the dispute is resolved through international arbitration, the leaders can say ‘we have tried our best, but somebody (in charge of the arbitration) thinks differently’,” Moro said. In 2009 Juba and Khartoum turned to the Permanent Court of Arbitration in The Hague to define the borders and inhabitants of Abyei. But Khartoum rejected the court’s decision. “The situation is different now, however, and Khartoum is under immense pressure and it is likely that they would accept the result of any arbitration,” Wesselink said. Despite the current tension along the borders, especially between the armies of the two countries, the border communities have for long lived fairly peacefully side by side. Given the years and years of intermarriage, it is only natural that the communities would be unhappy with a borderline dividing them, Yakani said. “People along the border know each other better than people in Khartoum and Juba do. Let these communities be asked to prescribe a solution to the border disputes based on a way that suits their interests,” he said.